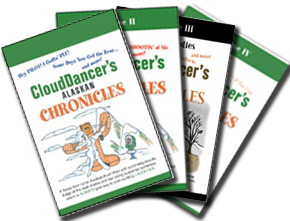 CloudDancer's Alaskan Chronicles books for sale, the outrageous stories of a young Alaskan bush pilot. Buy them now! Buy all 4 and get FREE Shipping! 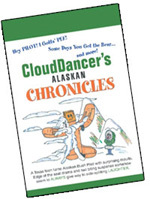 Buy ANY combination of FOUR or more books and CloudDancer eats the shipping and handling charges. That's right- FREE SHIPPING on orders of four books or more- you'll SAVE $10 or more in shipping costs! Please allow up to 14 days for delivery when ordering through PAYPAL. Please allow up to 21 days from the date you mail your check for delivery. Don't forget...I still gotta' FLY four or five days a week too! 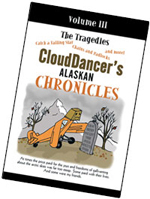 In either case I will be HAPPY and PROUD to autograph your book(s) in the manner in which you request.